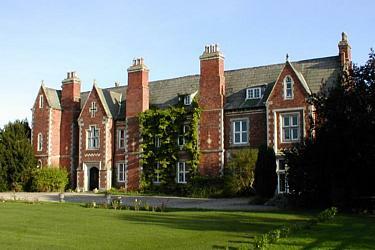 Welcome to the website of Red House Estate, Moor Monkton, England. A place where you can enjoy the countryside of the Vale of York, close to the city of York but seemingly miles from anywhere. We have residential and commercial property to let, equestrian facilities, DIY livery, riding holidays, a caravan site and much more. This year's equestrian diary is available here. This contains our own events so far but more dates will follow. We are very excited to announce that we are now offering self catering holiday accommodation. Full details and pricing will be available very soon. In the meantime you can visit the Holiday Home section. Wind has been the the weather feature of the week. 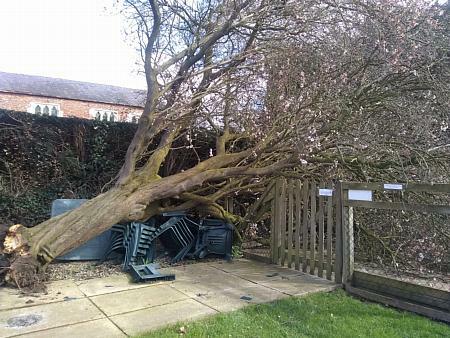 Storm Gareth blew over on Tuesday night and toppled the beautiful ornamental plum tree by the swimming pool gate. It had just come out into blossom and we were looking forward to its deep red, summer foliage. However, fungi had got into its roots and it fell on the corner of the pool fence. Damage could have been quite costly but we got away with one broken fence rail and 8 crushed chairs. The expensive winter and summer pool covers were unscathed as only the outer branches were resting on these. Click here to see the full Red House picture archive. Facebook Page and YouTube Channel. Website last updated 18th of April 2019.
visits since 21st January 2008.